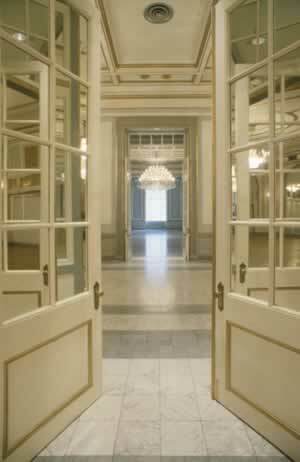 Pocket doors are hallmarks of Victorian, Classical, and Gilded Age architecture. And you'll find pocket door replicas like these in today's neo-colonial homes. Pocket doors separate social areas and great rooms of the home from utility spaces, sliding out of way to open out large halls. In addition to separating rooms, they extend the dimensions of your home. You'll find it a snap to have quiet conversations in salons adjacent to rooms bustling with visitors. Today's pocket doors can be fitted with state-of-the-art keypad locks for security. Unlike the original versions of pocket doors, today's installations won't jamb in their compartments as a result of the house shifting or settling over time. They come fitted without bolts or hinges that weaken the assembly. Frames are available in heavy gauge steel and or composite material and powdered to color. Pockets can also increase insulation and energy conservation between rooms.